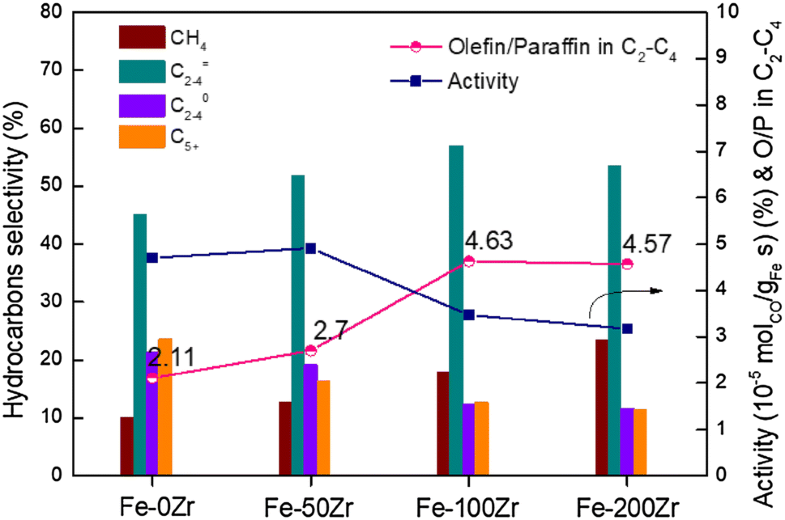 Direct conversion of synthesis gas to light olefins (ethylene, propylene, and butylenes) over Fe–Zr co-precipitated catalysts was investigated in a continuous-flow fixed-bed reactor at industrially relevant conditions. 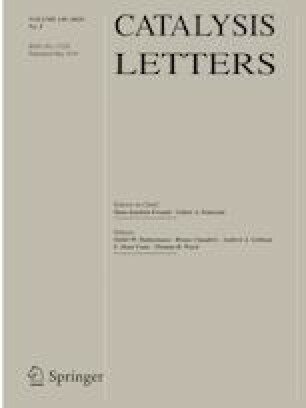 The effect of incorporation of zirconium on the textural properties, surface physicochemical properties, and reduction/carburization ability of Fe-based multi-component catalysts were examined by N2 adsorption–desorption, X-ray diffraction, transmission electron microscope, H2 temperature-programmed reduction (H2-TPR), CO temperature-programmed reduction, and X-ray photoelectron spectroscopy. The results indicated that the addition of less zirconium can promote the dispersion of iron oxide particles and increase the specific surface area of catalyst, leads to a higher Fischer–Tropsch synthesis activity. However, excessive addition of the zirconium promoter will cover the surface active sites and suppress the reduction and carburization of catalyst, which lead to lower activity. Meanwhile, the catalytic stability was destroyed by the addition of less Zr. The charge transfer between Fe and other promoter was redistributed by Zr, which disturbed the original Fe–Mg interaction. When the content of Zr further increased, the stability was improved again by a new formed Fe–Zr interaction. The zirconium promoter can effectively inhibit the chain growth probability and hydrogenation ability, resulting in the improvement of light olefins selectivity. This work was supported by National Natural Science Foundation of P. R. China (No. 91334206 and 21606011), National “863” program of P. R. China (No. 2013AA031702), and China Postdoctoral Science Foundation (2016M591051 and 2017T100029).